This is Day 21 of our 31 Days of Less & More challenge. To read all the posts in order, start with Day 1, then visit the Overview Page to see the entire series. Do you ever feel like you are about to snap? I’m not sure how it works in your family, but in my home the level of tension between my husband and I seems to be always directly correlated to the amount of stress we are under. The more stressed one of us feels or the more pressure one of us is under, the more likely we are to take out our frustrations on each other. This, of course, only serves to make things worse. Stress leads to tension, which only leads to more stress. It goes to follow that if we truly want to lessen the stress in our life, we will have to actively work to lessen our tension. We need to step away from the edge and loosen the emotional strings so tightly wound they threaten to snap at the slightest provocation. Take a deep cleansing breath. When we get stressed we unconsciously take shallower breaths, which only compounds our anxiety because we are getting less oxygen. Breathe in through your nose, then let it out through your mouth. Repeat as many times as necessary. Take a walk around the block. It is better to step away from a tense situation than compound it. A little exercise and some perspective can make all the difference. Say a prayer. 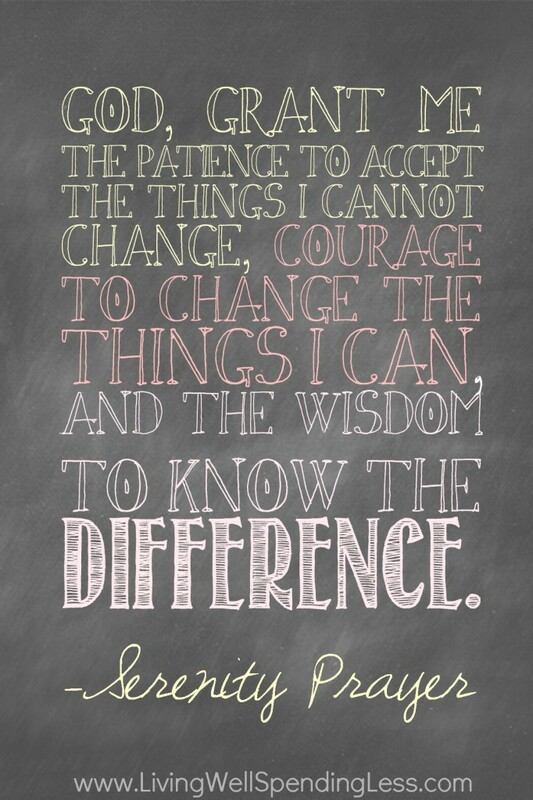 If you’re not sure what to say, try the tried-and-true Serenity Prayer: God, grant me the patience to accept the things I cannot change, courage to change the things I can, and the wisdom to know the difference. Be sure to read Edie’s corresponding post, More Patience. Identify a recent situation where you felt stressed or tense and, as a result, snapped at a loved one. Reflect on how you could have handled the situation differently. What are some ways you can think of to alleviate tension in your day-to-day life? Do you ever struggle with feeling tense and angry? What helps relieve that tension and stress? I SOOO needed this one today! Thank you! Good tips! When I feel like I’m about to snap, I do some breathing exercises or go someplace quiet where I can meditate for a few minutes. Just stopping and hitting “pause” is enough to diffuse my anger. These are great tips and they really do work! I love to start my day with a walk whenever possible, seems to make my day much smoother.